Home Inspections can be described as Pre-Purchase, Pre-Listing and/or Maintenance of your home, or potential home. The Pre-Purchase home inspection has become an essential part of buying a home. Pro Vision Inspection Services understands the inner workings of residential construction, offers consumers an expert opinion regarding the condition of a home before the purchase is made. Most real estate agents will agree that a house in good physical condition is more likely to sell, and command a higher price, than one that needs a lot of repair. Yet approximately half of the resale homes on the market today have at least one significant defect, and just about all homes need some maintenance and repair work. A Pre-Listing home inspection will also alert you to a variety of other maintenance improvements that will enhance your home’s appearance and marketability. The Provision BASIC Home Inspection includes a thorough visual investigation of the home’s readily accessible features, major systems and their components such as structure, foundation, roof, interior, exterior, heating and ventilation system, electrical, plumbing and more. We also use infrared, thermal imaging equipment. Thermal imaging equipment is able to detect what no eye can see – minor variations in temperature that can signal electrical or moisture problems. A thermographic scan of the home is NOT included in the BASIC inspection, however, the use of the infrared camera may be used for localized diagnostic purposes, at the inspector’s discretion. Provision Inspections Services includes a thorough visual investigation of the home’s readily accessible features, major systems and their components such as structure, foundation, roof, interior, exterior, heating and ventilation system, electrical, plumbing and more. 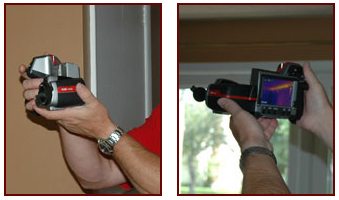 With the EXTENDED Home Inspection, we will use the power of infrared, thermal imaging equipment to enhance your home inspection. Thermal imaging helps us identify surface temperature variations of the building envelop, which are directly related to the problems in structure, moisture content and air leakage. We also use it to find loss of heat and coolness due to the intrusion of moisture, inadequate or non-existing insulation and poor construction. It’s important to correct these conditions early to prevent additional damage in the future. Each room within the living area will have a thorough thermographic scan; this includes the attic (if accessible), roof, walls, floors, ceilings and foundation. Radon Testing We offer a full range of testing services for residential, public or commercial buildings. Testing time frames can extend over three days, three months, six months or a year depending on the urgency of your request as well as your comfort level in regards to test result waiting times. We are more than willing to meet with you to discuss the various options and costs involved. Radon Mitigation Repairing a home or workplace with a high radon level is usually referred to as “mitigating”. Download the Radon Testing Agreement forms for Homeowners, Sellers and Buyers.